The environmental impact of concrete, its manufacture and applications, are complex. Some effects are harmful; others welcome. Many depend on circumstances. A major component of concrete is cement, which has its own environmental and social impacts and contributes largely to those of concrete. The cement industry is one of the primary producers of carbon dioxide, a potent greenhouse gas. Concrete causes damage to the most fertile layer of the earth, the topsoil. Concrete is used to create hard surfaces which contribute to surface runoff that may cause soil erosion, water pollution and flooding. Conversely, concrete is one of the most powerful tools for proper flood control, by means of damming, diversion, and deflection of flood waters, mud flows, and the like. Light-colored concrete can reduce the urban heat island effect, due to its higher albedo. Concrete dust released by building demolition and natural disasters can be a major source of dangerous air pollution. The presence of some substances in concrete, including useful and unwanted additives, can cause health concerns due to toxicity and (usually naturally occurring) radioactivity. Wet concrete is highly alkaline and should always be handled with proper protective equipment. Concrete recycling is increasing in response to improved environmental awareness, legislation, and economic considerations. Conversely, the use of concrete mitigates the use of alternative building materials such as wood, which is a carbon sink. Concrete structures also last much longer than wood structures. 2 produced for the manufacture of structural concrete (using ~14% cement) is estimated at 410 kg/m3 (~180 kg/tonne @ density of 2.3 g/cm3) (reduced to 290 kg/m3 with 30% fly ash replacement of cement). The CO2 emission from the concrete production is directly proportional to the cement content used in the concrete mix; 900 kg of CO2 are emitted for the fabrication of every ton of cement, accounting for 88% of the emissions associated with the average concrete mix. Cement manufacture contributes greenhouse gases both directly through the production of carbon dioxide when calcium carbonate is thermally decomposed, producing lime and carbon dioxide, and also through the use of energy, particularly from the combustion of fossil fuels. One area of the concrete life cycle worth noting is the fact that concrete has a very low embodied energy relative to the quantity that is used. This is primarily the result of the fact that the materials used in concrete construction, such as aggregates, pozzolans, and water, are relatively plentiful and can often be drawn from local sources. This means that transportation only accounts for 7% of the embodied energy of concrete, while the cement production accounts for 70%. With a total embodied energy of 1.69 GJ/tonne concrete is lower than any other building material besides wood. It is worth noting that this value is based on mix proportions for concrete of no more than 20% fly ash. It is estimated that one percent replacement of cement with fly ash represents a .7% reduction in energy consumption. With some proposed mixes containing as much as 80% fly ash, this would represent a considerable energy savings. There is a growing interest in reducing carbon emissions related to concrete from both the academic and industrial sectors, especially with the possibility of future carbon tax implementation. Several approaches to reducing emissions have been suggested. One reason why the carbon emissions are so high is because cement has to be heated to very high temperatures in order for clinker to form. A major culprit of this is alite (Ca3SiO5), a mineral in concrete that cures within hours of pouring and is therefore responsible for much of its initial strength. However, alite also has to be heated to 1,500 °C in the clinker-forming process. Some research suggests that alite can be replaced by a different mineral, such as belite (Ca2SiO4). Belite is also a mineral already used in concrete. It has a roasting temperature of 1,200 °C, which is significantly lower than that of alite. Furthermore, belite is actually stronger once concrete cures. However, belite takes on the order of days or months to set completely, which leaves concrete weak for an unacceptably long time. Current research is focusing on finding possible impurity additives, like magnesium, that might speed up the curing process. It is also worthwhile to consider that belite takes more energy to grind, which may make its full life impact similar to or even higher than alite. Another approach has been the partial replacement of conventional clinker with such alternatives as fly ash, bottom ash, and slag, all of which are by-products of other industries that would otherwise end up in landfills. Fly ash and bottom ash come from thermoelectric power plants, while slag is a waste from blast furnaces in the ironworks industry. These materials are slowly gaining popularity as additives, especially since they can potentially increase strength, decrease density, and prolong durability of concrete. The main obstacle to wider implementation of fly ash and slag may be largely due to the risk of construction with new technology that has not been exposed to long field testing. Until a carbon tax is implemented, companies are unwilling to take the chance with new concrete mix recipes even if this reduces carbon emissions. However, there are some examples of “green” concrete and its implementation. One instance is a concrete company called Ceratech that has started manufacturing concrete with 95% fly ash and 5% liquid additives. Another is the I-35W Saint Anthony Falls Bridge, which was constructed with a novel mixture of concrete that included different compositions of Portland cement, fly ash, and slag depending on the portion of the bridge and its material properties requirements. Furthermore, the production of concrete requires large amounts of water, and global production accounts for almost a tenth of worldwide industrial water use. This amounts to 1.7 percent of total global water withdrawal. A study that appeared in Nature Sustainability in 2018 predicts that concrete production will in the future increase pressure on water resources in regions suscepitble to drought conditions: "In 2050, 75% of the water demand for concrete production will likely occur in regions that are expected to experience water stress." Italian company Italcementi designed a kind of cement that is supposedly alleviating air pollution by breaking down pollutants that come in contact with the concrete, through the use of titanium dioxide absorbing ultraviolet light. Some environmental experts nevertheless remain skeptical and wonder if the special material can 'eat' enough pollutants to make it financially viable. Jubilee Church in Rome is built from this kind of concrete. Another proposed method of absorbing emissions is to absorb CO2 in the curing process. Recent research has proposed the use of an admixture (a dicalcium silicate y phase) that absorbs CO2 as the concrete cures. With the use of coal ash or another suitable substitute, this concrete could theoretically have a CO2 emissions below 0 kg/m3, compared to normal concrete at 400 kg/m3. The most effective method of production of this concrete would be using the exhaust gas of a power plant, where an isolated chamber could control temperature and humidity. Even besides the use of advanced additives, carbonation naturally occurs within concrete, thus causing it to absorb CO2 in a process that is effectively the reverse of cement production. While concerns about corrosion of reinforcement and alkalinity loss remain, this process cannot be discounted. There are many other improvements to concrete that do not deal directly with emissions. Recently, much research has gone into “smart” concretes: concretes that use electrical and mechanical signals to respond to changes in loading conditions. One variety uses carbon fiber reinforcement which provides an electrical response that can be used to measure strain . This allows for monitoring the structural integrity of the concrete without installing sensors. The road construction and maintenance industry consumes tonnes of carbon intensive concrete every day to secure road-side and urban infrastructure. As populations grow this infrastructure is becoming increasingly vulnerable to impact from vehicles, creating an ever increasing cycle of damage and waste and ever increasing consumption of concrete for repairs (roadworks are now seen around our cities on almost a daily basis). A major development in the infrastructure industry involves the use of recycled petroleum waste to protect the concrete from damage and enable infrastructure to become dynamic, able to be easily maintained and updated without disturbance to the existing foundations. This simple innovation preserves the foundations for the entire lifespan of a development. Another area of concrete research involves the creation of certain “waterless” concretes for use in extraplanetary colonization. Most commonly, these concretes use sulfur to act as a non-reactive binder, allowing for construction of concrete structures in environments with no or very little water. These concretes are in many ways indistinguishable from normal hydraulic concrete: they have similar densities, can be used with currently existing metal reinforcement, and they actually gain strength faster than normal concrete This application has yet to be explored on Earth, but with concrete production representing as much as two-thirds of the total energy usage of some developing countries, any improvement is worth considering. Another approach is to pump liquid carbon dioxide into the concrete before mixing. This can reduce the carbon emissions from concrete production when combined with a power plant or other industry that produces CO2. Surface runoff, when water runs off impervious surfaces, such as non-porous concrete, can cause severe soil erosion and flooding. Urban runoff tends to pick up gasoline, motor oil, heavy metals, trash and other pollutants from sidewalks, roadways and parking lots. Without attenuation, the impervious cover in a typical urban area limits groundwater percolation and causes five times the amount of runoff generated by a typical woodland of the same size. A 2008 report by the United States National Research Council identified urban runoff as a leading source of water quality problems. In an attempt to counteract the negative effects of impervious concrete, many new paving projects have begun to use pervious concrete, which provides a level of automatic stormwater management. Pervious concrete is created by careful laying of concrete with specifically designed aggregate proportions, which allows for surface runoff to seep through and return to the groundwater. This both prevents flooding and contributes to groundwater replenishment. If designed and layered properly, pervious concrete and other discreetly paved areas can also function as an automatic water filter by preventing certain harmful substances like oils and other chemicals from passing through. Unfortunately there are still downsides to large scale applications of pervious concrete: its reduced strength relative to conventional concrete limits use to low-load areas, and it must be laid properly to reduce susceptibility to freeze-thaw damage and sediment buildup. Both concrete and asphalt are the primary contributors to what is known as the urban heat island effect. Using light-colored concrete has proven effective in reflecting up to 50% more light than asphalt and reducing ambient temperature. A low albedo value, characteristic of black asphalt, absorbs a large percentage of solar heat and contributes to the warming of cities. By paving with light colored concrete, in addition to replacing asphalt with light-colored concrete, communities can lower their average temperature. In many U.S. cities, pavement covers about 30–40% of the surface area. This directly affects the temperature of the city and contributes to the urban heat island effect. Paving with light-colored concrete would lower temperatures of paved areas and improve night-time visibility. The potential of energy saving within an area is also high. With lower temperatures, the demand for air conditioning theoretically decreases, saving energy. However, research into the interaction between reflective pavements and buildings has found that, unless the nearby buildings are fitted with reflective glass, solar radiation reflected off pavements can increase building temperatures, increasing air conditioning demands. Atlanta has tried to mitigate the heat-island effect. City officials noted that when using heat-reflecting concrete, their average city temperature decreased by 6 °F (3.3 °C). The Design Trust for Public Space found that by slightly raising the albedo value in New York City, beneficial effects such as energy savings could be achieved. It was concluded that this could be accomplished by the replacement of black asphalt with light-colored concrete. However, in winter this may be a disadvantage as ice will form more easily and remain longer on the light colored surfaces as they will be colder due to less energy absorbed from the reduced amount of sunlight in winter. Building demolition and natural disasters such as earthquakes often release a large amount of concrete dust into the local atmosphere. Concrete dust was concluded to be the major source of dangerous air pollution following the Great Hanshin earthquake. The presence of some substances in concrete, including useful and unwanted additives, can cause health concerns. Natural radioactive elements (K, U, Th, and Rn) can be present in various concentration in concrete dwellings, depending on the source of the raw materials used. For example, some stones naturally emit Radon, and Uranium was once common in mine refuse. Toxic substances may also be unintentionally used as the result of contamination from a nuclear accident. Dust from rubble or broken concrete upon demolition or crumbling may cause serious health concerns depending also on what had been incorporated in the concrete. However, embedding harmful materials in concrete is not always dangerous and may in fact be beneficial. In some cases, incorporating certain compounds such as metals in the hydration process of cement immobilizes them in a harmless state and prevents them from being released freely elsewhere. Handling of wet concrete must always be done with proper protective equipment. Contact with wet concrete can cause skin chemical burns due to the caustic nature of the mixture of cement and water. Indeed, the pH of fresh cement water is highly alkaline due to the presence of free potassium and sodium hydroxides in solution (pH ~ 13.5). Eyes, hands and feet must be correctly protected to avoid any direct contact with wet concrete and washed without delay if necessary. Concrete recycling is an increasingly common method of disposing of concrete structures. Concrete debris was once routinely shipped to landfills for disposal, but recycling is increasing due to improved environmental awareness, governmental laws and economic benefits. Concrete, which must be free of trash, wood, paper and other such materials, is collected from demolition sites and put through a crushing machine, often along with asphalt, bricks and rocks. Reinforced concrete contains rebar and other metallic reinforcements, which are removed with magnets and recycled elsewhere. The remaining aggregate chunks are sorted by size. Larger chunks may go through the crusher again. 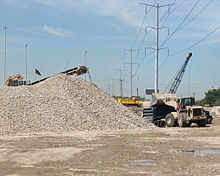 Smaller pieces of concrete are used as gravel for new construction projects. Aggregate base gravel is laid down as the lowest layer in a road, with fresh concrete or asphalt placed over it. Crushed recycled concrete can sometimes be used as the dry aggregate for brand new concrete if it is free of contaminants, though the use of recycled concrete limits strength and is not allowed in many jurisdictions. On 3 March 1983, a government-funded research team (the VIRL research.codep) approximated that almost 17% of worldwide landfill was by-products of concrete-based waste. ^ a b c d "Cool Pavement Report" (PDF). Environmental Protection Agency. June 2005. Retrieved 6 February 2009. ^ CDC (2015-12-07). "Radiation from Building Materials". Centers for Disease Control and Prevention. Retrieved 2019-02-25. ^ Mahasenan, Natesan; Steve Smith; Kenneth Humphreys; Y. Kaya (2003). "The Cement Industry and Global Climate Change: Current and Potential Future Cement Industry CO2 Emissions". Greenhouse Gas Control Technologies – 6th International Conference. Oxford: Pergamon. pp. 995–1000. doi:10.1016/B978-008044276-1/50157-4. ISBN 978-0-08-044276-1. ^ a b Amato, Ivan (2013). "Green cement: Concrete solutions". Nature. 494 (7437): 300–301. doi:10.1038/494300a. PMID 23426307. Retrieved 26 May 2013. ^ Kim, H.; Lee, H. (2013). "Effects of High Volumes of Fly Ash, Blast Furnace Slag, and Bottom Ash on Flow Characteristics, Density, and Compressive Strength of High-Strength Mortar". J. Mater. Civ. Eng. 25 (5): 662–665. doi:10.1061/(asce)mt.1943-5533.0000624. ^ Fountain, Henry. "Concrete Is Remixed With Environment in Mind". The New York Times. Retrieved 26 May 2013. ^ a b Watts, Jonathan (2019-02-25). "Concrete: the most destructive material on Earth". The Guardian. ISSN 0261-3077. Retrieved 2019-02-25. ^ Miller, Sabbie A.; Horvath, Arpad; Monteiro, Paulo J. M. (January 2018). "Impacts of booming concrete production on water resources worldwide". Nature Sustainability. 1 (1): 69–76. doi:10.1038/s41893-017-0009-5. ISSN 2398-9629. ^ Higuchi, Takayuki (30 September 2014). "Development of a new ecological concrete with CO2 emissions below zero". Construction and Building Materials. 67: 338–343. doi:10.1016/j.conbuildmat.2014.01.029. ^ "CO2 Absorption". Sustainable Concrete. Concrete^3. Retrieved 2 November 2015. ^ Alter, Lloyd. "CarbonCure concrete blocks store CO2 for a lower carbon footprint". treehugger. ^ Water Environment Federation, Alexandria, VA; and American Society of Civil Engineers, Reston, VA. "Urban Runoff Quality Management." WEF Manual of Practice No. 23; ASCE Manual and Report on Engineering Practice No. 87. 1998. ISBN 978-1-57278-039-2. Chapter 1. ^ G. Allen Burton, Jr.; Robert Pitt (2001). Stormwater Effects Handbook: A Toolbox for Watershed Managers, Scientists and Engineers. New York: CRC/Lewis Publishers. ISBN 978-0-87371-924-7. Chapter 2. ^ U.S. Environmental Protection Agency (EPA). Washington, DC. "Protecting Water Quality from Urban Runoff." Document No. EPA 841-F-03-003. February 2003. ^ United States. National Research Council. Washington, DC. "Urban Stormwater Management in the United States." 15 October 2008. pp. 18–20. ^ a b "Pervious Concrete Pavement". US EPA. ^ "Atlanta Is Home To Largest Permeable Pavers Project In US". news.wabe.org. Retrieved 2015-11-03. ^ a b Gore, A; Steffen, A (2008). World Changing: A User's Giode for the 21st Century. New York: Abrams. p. 258. ^ Yaghoobian, N.; Kleissl, J. (2012). "Effect of reflective pavements on building energy use". Urban Climate. 2: 25. doi:10.1016/j.uclim.2012.09.002. ^ "Concrete facts". Pacific Southwest Concrete Alliance. Retrieved 6 February 2009. ^ Yamamoto, Ryoji; Nobuhiko, Nagai; Koizumi, Naoko; Ninomiya, Ruriko (1999). "Dust concentration around the sites of demolition work after the Great Hanshin-Awaji Earthquake". Environmental Health and Preventive Medicine. 3 (4): 207–214. doi:10.1007/BF02932260. PMC 2723556. ^ Ademola, J. A.; Oguneletu, P. O. (2005). "Radionuclide content of concrete building blocks and radiation dose rates in some dwellings in Ibadan, Nigeria". Journal of Environmental Radioactivity. 81 (1): 107–113. doi:10.1016/j.jenvrad.2004.12.002. PMID 15748664. ^ Fujita, Akiko (January 16, 2012). "Radioactive Concrete is Latest Scare for Fukushima Survivors". This page was last edited on 7 April 2019, at 02:30 (UTC).